Margot Miller has taught at Sheridan College , St. Lawrence College, Queen’s University and Sir Sandford Fleming College. She is an Honour Graduate of the Ontario College of Art and Design University and the Ecotourism Management Programme, Fleming College. She worked in the textile design industry in India and has traveled extensively in India and Asia, documenting traditional textile techniques. 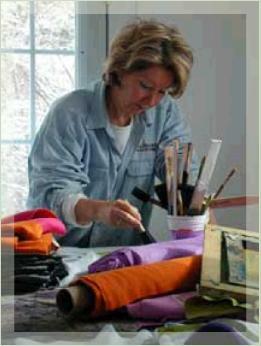 Currently she teaches and operates her own textile studio and shop in the village of Rockport. She is a recipient of a Design Canada Award and has exhibited at numerous galleries including the Art Gallery of Ontario, the National Film Board of Canada and the Ontario Craft Council. Her passion is a dedication to preserving our natural and cultural resources and she is a past board member of the Leeds Stewardship Council and the Algonquin to Adirondack Conservation Association. She is presently a member of theThousand Islands Residents Association and a board member of the Thousand Islands Arts Centre, Home of the Handweaving Museum, in Clayton, N.Y. She has been involved in the Dry Stone Wall Across Canada Association and leads tours to visit dry stone structures in various countries.